Crook is a darling girl who came from another humane society in hopes of her having better luck in finding her home. 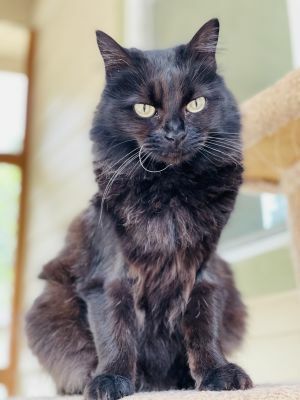 Crook gets along well with all other cats and doesn't seemed bothered by any changes in her life. She is shy for the first few minutes and then blossoms into a very cuddly and sweet girl. She is quiet and tolerates other cats without any arguments or yowling. She has shown zero signs of any behavioral problems or issues! 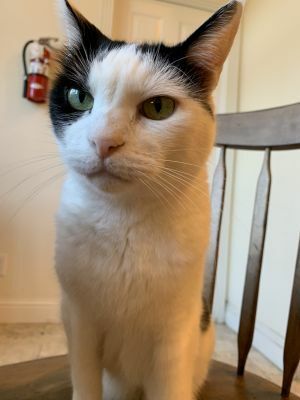 Although Crook is FIV+ we believe she is in great health and able to be a wonderful cat addition for your furever family! She would do well with all house types including homes with children. Sweetheart is a young girl with lots of energy. She loves to run around and play in the field with her friend Baby Girl. She is a big gal and can get very excited and even pushy when it comes to her food. Sweetheart is friendly, curious and ready for her forever home. 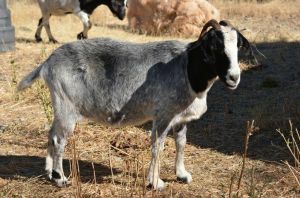 Her original owners raised her for meat but decided last minute that she is too loveable and couldn't go through with harvesting her and Baby Girl. They were raised with dogs and children and love to hangout with all of the other animals. Baby Girl is a young, sweet, playful girl. She loves to run around and play in the field with her friend Sweetheart. She can be a little shy in the beginning but will warm up quickly when she learns that you are the bearer tasty treats. She can get a little excited when it comes to feed time, and may try to take the food before you've set it down for her. Baby Girl is friendly, adorable and ready to find her forever family! 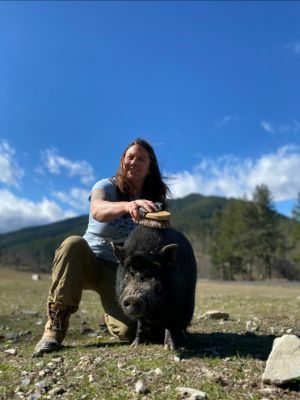 Her original owners raised her for meat but decided last minute that she is too loveable and couldn't go through with harvesting her and friend Sweetheart. 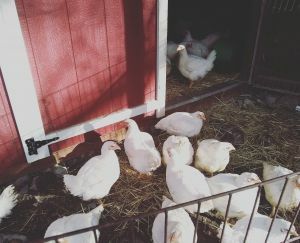 They were raised with dogs and children and love to hangout with all of the other animals. 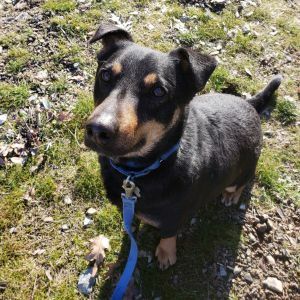 Fernie aka Ferniand is a great family dog awaiting his furever home. He was found as a stray in a nearby county and was picked up by animal control. He was obviously loved and fed well at one point in his life because he has about 20 extra pounds to his desired weight. 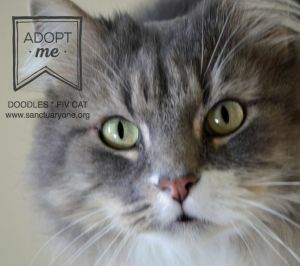 Fernie would love a family who is active and could help him shed some pounds. He has outstanding off and on leash skills and would do well with children and people of all ages. 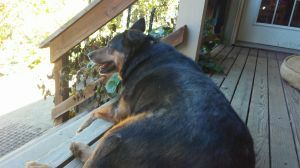 He has a tendency like most Queensland healers to bark and be anxious when his family leaves him so he would do well with a ranch style family or an owner with a few acres where he can work along side of you all day.. the important thing however, is that he has a lot of love and affection and regular walks. He gets along great with all dogs and cats and appears to be around 8 years of age. Colonel Mustard is one of the coolest dogs, hands down, you will ever meet! He has the most amazing disposition. He is extremely affectionate, sweet, loyal, playful, strong and out going. He needs a little bit of work with basic manners but this hunk is all about love! He does well with other dogs but needs slow introductions to make sure it's the right fit as far as energy levels go. If you have playful and active kids Colonel can keep them company and wear them out in no time. Come check out Colonel to find the newest and coolest addition to your family. He is around 2-3 years old and ready for his new home with you! Big Red is a social and loving rooster. He plays well with others and you can often find him hanging out with his pot belly friends and other farm animals. 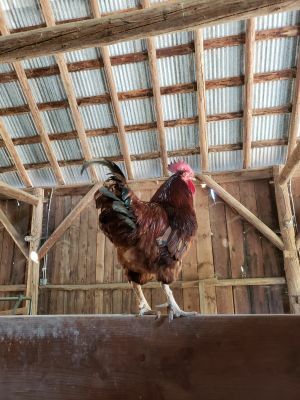 Big Red would love a flock of hens to call his own or would do well in a barn with other roosters. We rarely have to administer meds because he is in such great health but when it's time for his annual deworming he takes all syringe meds without a struggle. This sweet man would love some meal worms and a new barn to explore. Travolta is a strikingly handsome Ameraucana rooster who is easy to handle and ready for his forever home. He is getting along well with our other roosters and a variety of farm animals. Fill out an adoption application today and let Travolta know "You're the one that I want". 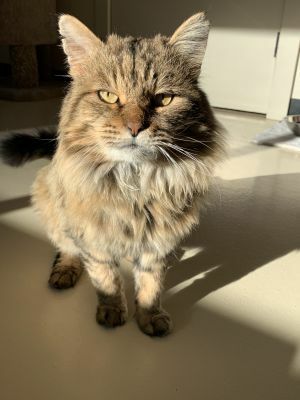 Jacques was transferred to us from another local shelter. He is a smart and playful young lad who loves scratches and belly rubs. Jacques has been doing excellent with his training. He knows the sit, down, wait, stay and come commands and will politely walk on a loose leash. He can be a little bit of a rascal when it comes to fences and likes to bark at dogs walking by. We have been working on helping him keep calm when he sees other dogs since he can get quite riled up. 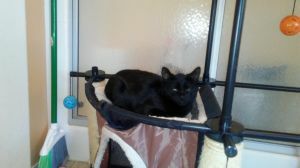 Jacques would do well in a nice quiet and calm home where he can relax and feel comfortable. We are continuing his training and hope that a family will come along who is just the right fit for this boy! Blinkin is a fun, affectionate Boer doe. She was born in 2009, and came to us with her Mother in 2010. So she has been with us almost 8 years! She's still ready and waiting for her forever home. She would love a herd with other goats similar to her to hang out with. She can be quite stubborn when she doesn't want to do something, but boy does she love to be loved on! She will freeze in place as long as you will pet her, and when that isn't enough she will cozy up to you and insist on more pets. This charming girl is more than ready for her forever humans and herd. Blinkin is also CL positive (Caseous Lympadenitis) so it is recommend she is not adopted out to CL negative herds. 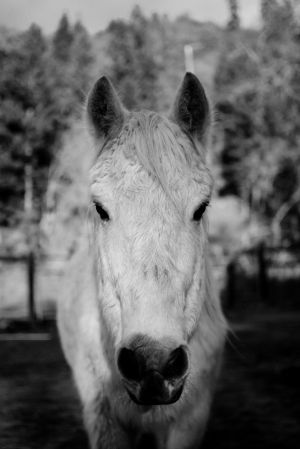 Viking is a likable, special needs senior wishing for his dream retirement pasture to come along. He is estimated at around 30 years old which would make him a grandpa for sure! He came to us from an animal control neglect case after being found to be extremely emaciated. Since 2014 he has made vast improvements to his weight and increased his desire for attention. Viking is smaller than most horses but still stands his ground and loves to do his thing here at our sanctuary. His favorite activities are relaxing and checking the barn doors regularly in case they aren't latched properly. 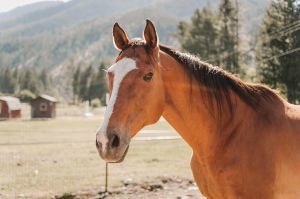 He would make a great companion horse to have around the barn and would be wonderful around children or kids. 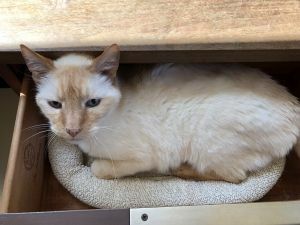 He has Cushing's Disease, which requires that he be on a special diet and supplements, but otherwise is relatively low maintenance. 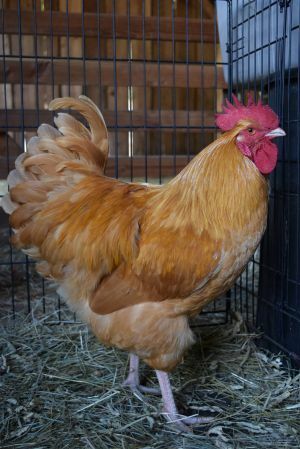 Carlos is a gorgeous, golden Buff Orpington rooster available for adoption only to the most experienced home. He is people aggressive and would do best with minimal human contact and a large flock of hens to protect. We believe there is a perfect home out there for every animal, including Carlos! 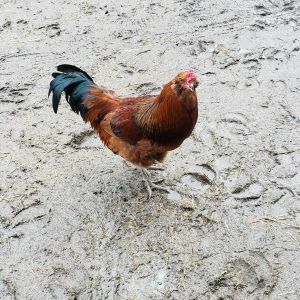 Perhaps there is a rooster whisperer out there just waiting for this beauty? Jake is an estimated 22 year old Thoroughbred mix around 16 hands tall. 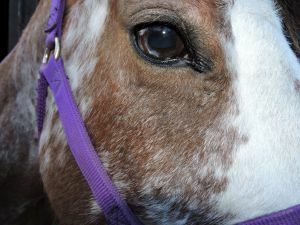 He had been dumped with wild horses in central Oregon and had wandered for quite some time with shoes on a couple feet. Thankfully he was rescued and transferred to Sanctuary One. Since his feet were not properly cared-for when he was in the wild, he has a bit of lingering hoof disease and he will not be ride able. Jake requires extra care by the staff throughout the year but especially in the winter. At times he is unable to hold himself up and exhibits a condition known as âWobblesâ His special needs require an expensive form of all natural herbs (Chinese cervical formula blend) as well as a certain type of horse feed. These herbs help him stay strong and maintain a wonderful weight. 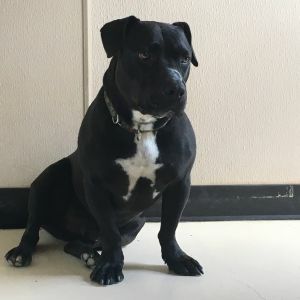 Along with donated acupuncture sessions with Dr. Judkins of Animalkind Holistic Vet Clinic, Jake has continued to improve dramatically throughout the last year. Marti has a beautiful white and black brindle body with a black masked face. 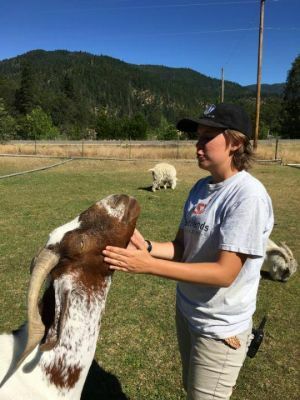 She came to us in September 2016, along with a few of her other goat and llama friends, from another Oregon sanctuary. She is very spunky and has a special goofy personality. 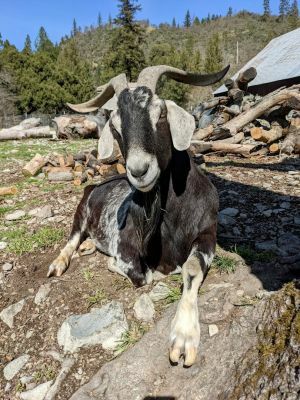 She is a senior goat and is about 16-17 years old. For more information on our adoption process, please visit us on the Web: www.sanctuaryone.org. You may also email us: info@sanctuaryone.org or telephone: 541-899-8627. Sodapop is approximately 4 years old and has been at the sanctuary for nearly 2 years. 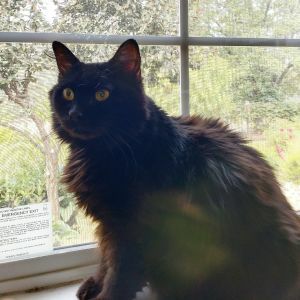 Sodapop is looking for a home that understands him. He was mishandled as a piglet, and as a consequence only cares for certain people and can be somewhat unpredictable. He will only be adopted to an experienced home. However, Sodapop is not without his charm! He's smart and food motivated, making him easy and fun to train. He knows his name, comes when called, and sits nicely. When his tummy is full, he loves to stretch out on his side for belly rubs. Maybe you're the partner Sodapop has been in need of all his life? Scout is a handsome, registered 17 year old pinto gelding measuring at around 5.2 hands. He is a unique boy with a fleck of blue in one eye and the funniest little mustache. 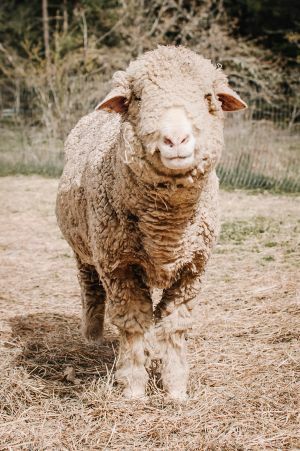 Scout came to Sanctuary One after his owner passed away in 2014. He loves to interact with people and has been a wonderful addition to our farm. He has a premature sway back so cannot be ridden unless a specially sized saddle is made. Scout is rather confident and does not care about the rope between his legs. He yields both ends nicely and is curious and engaged with people. 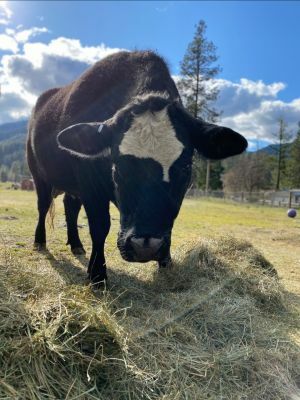 He could always use more circle games on hillsides to help him build his topline muscles This spunky but affectionate lad would make a delightful pet to any pasture and farm. Be prepared!! He just loves to be brushed and his favorite activity is rubbing his face on you while seeking out attention. 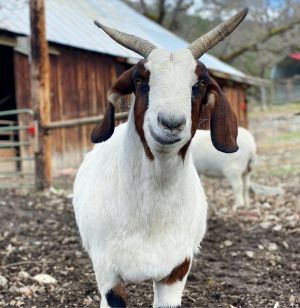 Betty was confiscated from a backyard butcher along with several other animals. 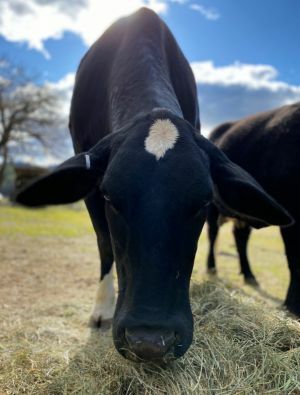 She ended up at an L.A. County shelter and from there was transferred to Farm Sanctuary. After being treated for illness, trimmed, vaccinated, and shorn, she was feeling much better. This long-legged lady is shy and sometimes hides behind the other animals, but every visitor that comes out is one more person to teach her that most people are kind and can be trusted. Betty was born in 2007 and has been with us since about 2013. She is approximately 12.. 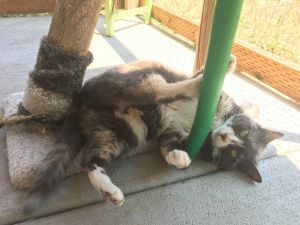 This special senior keeps hanging on and absolutely loves life here at our Sanctuary. Fill out our online adoption form and our staff will contact you to schedule an appointment to meet your new best friend. People don’t like to be separated from their loved ones. Neither do animals. For this reason, we strive to keep closely-bonded animal pairs together.